Featuring smart, versatile components that grow with you as your needs change, the PSM®200 series is a practical alternative to floor wedges for performers who want to start out in ear and stay there. The P2T Wireless TransMixer is another breakthrough design for personal monitoring. 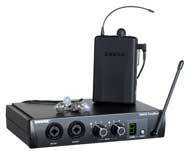 It allows the user to connect two line-level or mic-level inputs directly into the transmitter. The two signals can then be mixed independently. You can connect microphones or instruments directly to the inputs, use line outputs from a mixing console, or connect it to the Shure AuxPander. In short, no matter what the output device, you can probably plug it into the TransMixer.